I grew up playing a slew of Nintendo Entertainment System golf games that I acquired over the years thanks to my grandmother’s obsession with flea markets, garage sales, and spoiling her favourite grandson. I fondly remember the simplicity and the controls, which were easy to grasp. So easy, in fact, my non-gaming grandfather would play these games with me. He even dreamt about playing golf against me while under anaesthesia during surgery for the colon cancer that eventually took his life. You’re probably wondering, “How does that relate to the Switch exclusive Golf Story, for which I’m reading a review?”. 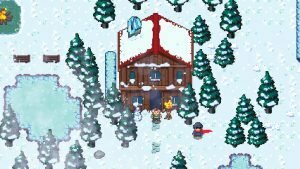 Golf Story (Nintendo Switch) – gameplay images via Sidebar Games. Well, for starters, it uses the very same controls for the golfing segments that many of those classic games used. Simply aim your shot, press a button to start a point down a bar that gauges how hard you’ll hit the ball, press a button at desired strength, then press the same button once more to decide whether or not you hit the ball straight on or slice it. Not only are the controls simple, but the overall mechanics don’t get much deeper than considering on-screen information such as how strong the wind is and which way the ground may be slanted; basic concepts that even those unfamiliar with golf can grasp. 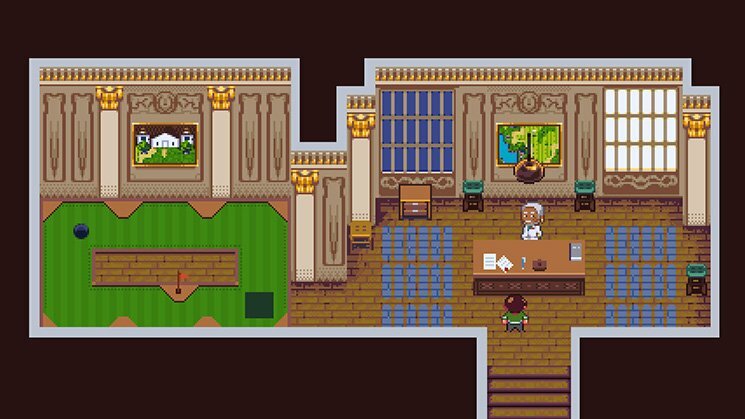 Another way Golf Story relates to my story is how it tells the tale of a father who is teaching his boy how to golf. Obviously, in my case, the role was reversed, but it’s still a story of male bonding in a way. Rarely do video games show tender moments between male characters or even contain father figures at all, let alone charming beginnings involving your in-game dad cheering you on while you’re putting. From there Golf Story fast forwards 20 years into the future and finds you estranged from your wife (whom you basically ignore to follow your dream of becoming a golf pro), and thus is the setting for our story about golf. The narrative doesn’t get much deeper than that for the most part, and you begin working towards your first ever pro tournament while trying to make an impression along the way. Even if you’re not a fan of golf or RPGs there is still plenty to enjoy here. Each course has patrons that will offer tasks the player can complete to earn experience points and cash. Many of these challenges involve simply hitting the ball to designated areas, typically in specific ways that slowly teach you more advanced mechanics and tactics. Other challenges are a bit sillier, like throwing golf balls at barrels, finding hidden objects stored around levels, and hitting targets. I really appreciated the inclusion of disc golf, which while similar is different enough to be refreshing after a few rounds of regular golf. Also, there is a bit of minigolf, where players bounce their ball around small courses requiring a hole-in-one. If you’re expecting a super serious golf game, you’ll be disappointed. Courses include a tundra, cliffs, a spooky graveyard filled with pumpkins, and feature obstacles such as moles, birds, and alligators—all of which can impact your game if you happen to land close to them. All of this is presented with adorable and colourful 16-bit graphics and a soundtrack that compliments each level’s theme such as smooth jazz for the more modern course and spooky music for the Halloween holes. 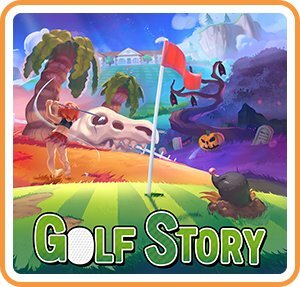 While I absolutely love Golf Story and think it is a must play title, I encourage potential buyers to wait or use caution. At the time of writing the game has a few annoying bugs, one of which can prevent progress (don’t save in the Tidy Park clubhouse or you could be stuck there with no other option than to start a new save file!) I personally experienced a few moments where I couldn’t advance to the next screen or interact with a character that I needed to progress until I saved and restarted the game. Another time I hit a ball far off the screen and out of bounds due to it bouncing off of a pumpkin, at which point the game wouldn’t register the ball being hit back towards the course. Thankfully I never encountered any game breaking bugs, which would have totally bummed me out considering I put in around 19 hours to essentially 100% the game. Aside from the main story, there is a quick play option that allows two players to duke it out on any of the courses, including a trilogy of NES Golf-like games that are unlocked via the story mode called Galf. Each Galf title even comes with its own mock manual that captures the absurdity of many NES manuals. 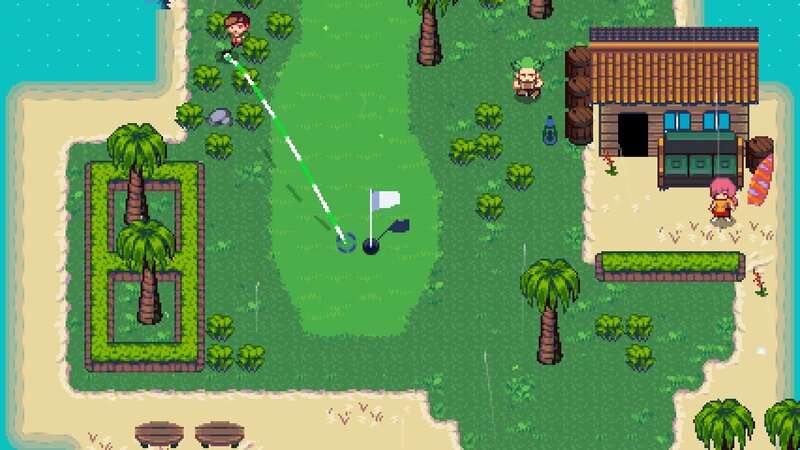 While I haven’t played many golf games since the days of the Nintendo Entertainment System, I have to say that Golf Story is my new favourite. Not only because of nostalgia for my time spent playing primitive golf games with my grandpa, but also because the game is bright, cheery, funny at times, and an all-around joy to play. 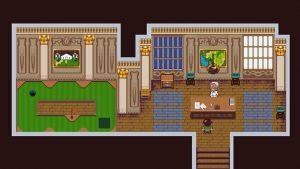 I smiled from the beginning to the end of Golf Story, and I hope this isn’t the only story the game’s very small dev team has to tell. 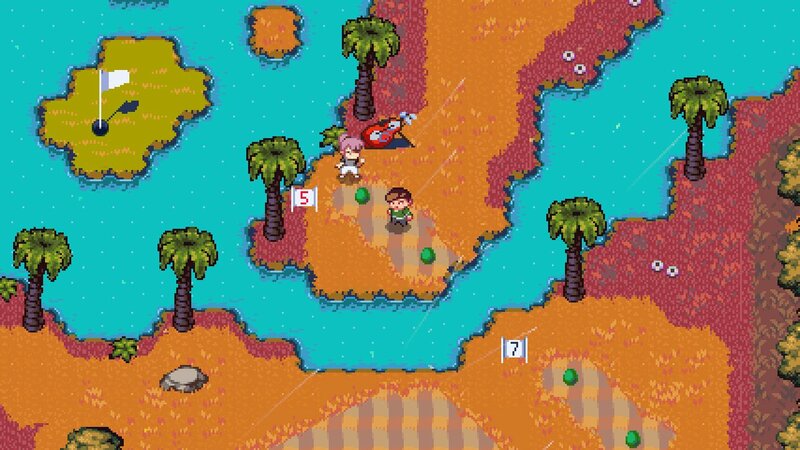 Easily the best golf RPG I’ve ever played. Your move Mario Golf. Update: Sidbargames are aware of the bugs and have already submitted an update that was not yet live at the time of this review’s release. 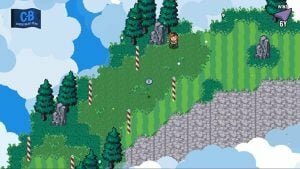 Golf Story was reviewed using “retail” Nintendo Switch download codes provided by Sidebar Games. You can find additional information about CGMagazine’s ethics and review policies and procedures here. Liked this article and want to read more like it? Check out Jed’s take on Marvel vs. Capcom: Infinity and Hob! Golf Story is another must play Switch exclusive for more than just golf or RPG fans.